The following is a copy of Bufftech's warranty. 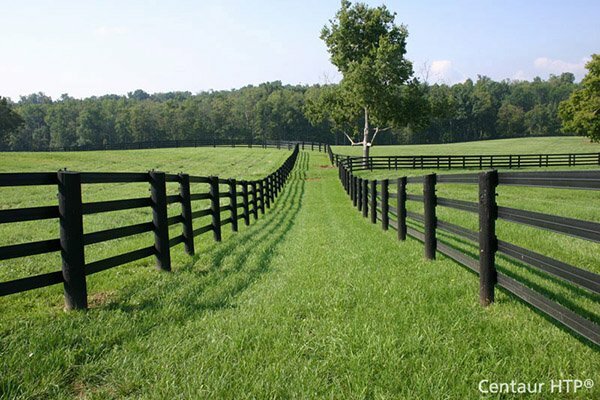 Originals may be obtained from Hoover Fence Co. upon the purchase of your fence. CertainTeed warrants to the original homeowner/consumer that its Bufftech vinyl fencing, decking and railing products will be free from manufacturing defects - including peeling, flaking, blistering and corroding - when subject to normal and proper use. Should any defect occur during the lifetime of the original purchaser (and as long as the original purchaser is still living and retains ownership of the property), CertainTeed will repair or replace, at its option, the defective fencing, decking or railing product. CertainTeed also reserves the right to refund the amount paid by the original owner for the fencing, decking or railing (but not including the cost of its initial installation). In no event shall CertainTeed be liable or responsible for labor charges or other expenses whatsoever in connection with removal or installation of either the original or replacement product. In the event of repair or replacement under the terms of this warranty, the warranty on the repaired or replaced fencing, decking or railing material will extend for the balance of the warranty period in effect at the time the material proves defective. The lifetime coverage offered by this warranty is designed to cover individual homeowners only. In the case of fencing, decking or railing material purchased by, or installed upon property owned by, corporations, government agencies, partnerships, trusts, religious organizations, schools, condominiums or cooperative housing arrangements, or installed on apartment buildings or any other type of building or premises not used by individual homeowners as their residences, the warranty period will be 30 years following the installation of the fence, deck or railing. Misuse, abuse, neglect or improper handling or storage;Improper installation or installation not in strict adherence to CertainTeed's written instructions;Use of accessories which do not properly receive and/or secure CertainTeed fencing, decking and railing;Impact of foreign objects, fire, earthquake, flood, lightning, hail, hurricane, tornado or other casualty or act of God;Movement, distortion, collapse or settling of the ground or structure on which the fencing, decking or railing is installed;Any other cause not involving manufacturing defects in the material supplied by CertainTeed. The fencing, decking and railing is not warranted against discoloration or other damage caused by air pollution (including but not limited to metal oxides or metallic particles), mildew, exposure to harmful chemicals or normal weathering from the elements. Normal weathering is defined as exposure to sunlight and extremes of weather and atmosphere which will cause any colored surface to gradually fade, chalk, or accumulate dirt or stains. The severity of any condition depends on the geographical location of the fencing, decking or railing, the cleanliness of the air in the area, and many other influences over which CertainTeed has no control. Notwithstanding anything set forth above, the fencing, decking and railing is warranted against yellowing of the product due to normal weathering from the elements. CertainTeed shall have sole discretion to determine, based on reasonable criteria, whether the fencing, decking or railing is suffering from normal weathering. If the fencing, decking or railing weathers to a degree determined by CertainTeed to be beyond normal, CertainTeed will either repair or provide replacement material, at its option, for the defective fencing, decking or railing. CertainTeed also reserves the right to refund the amount paid by the original owner for the fencing, decking or railing material and accessories (but not including the cost of its initial installation). This warranty does not apply to fencing, decking or railing which has been painted, varnished or coated over the manufacturer's original finish. CertainTeed reserves the right to discontinue or modify any of its products, including the color, without notice to the homeowner/consumer, nor shall CertainTeed be liable in the event the replacement material may vary in color or gloss in comparison to the original product as a result of normal weathering. If CertainTeed replaces any material under this warranty, it may substitute products designated by CertainTeed to be of comparable quality or price range in the event the product initially installed has been discontinued or modified. THIS WARRANTY REPLACES ALL OTHER ORAL OR WRITTEN WARRANTIES, LIABILITIES, OR OBLIGATIONS OF CERTAINTEED. PERTINENT STATE LAW SHALL CONTROL FOR WHAT PERIOD OF TIME FOLLOWING THE SALE A HOMEOWNER/CONSUMER MAY SEEK A REMEDY UNDER THE IMPLIED WARRANTY OF MERCHANTABILITY OR FITNESS FOR A PARTICULAR PURPOSE. IN NO EVENT SHALL CERTAINTEED BE LIABLE FOR CONSEQUENTIAL OR INCIDENTAL DAMAGES OF ANY KIND, INCLUDING ANY DAMAGE TO THE BUILDING, ITS CONTENTS OR ANY PERSON THEREIN, RESULTING FROM THE BREACH OF THIS WARRANTY. CERTAINTEED DOES NOT AUTHORIZE ITS DISTRIBUTORS OR DEALERS TO MAKE ANY CHANGE OR MODIFICATION TO THIS WARRANTY. SOME STATES DO NOT ALLOW LIMITATIONS ON, OR THE EXCLUSION OF, INCIDENTAL OR CONSEQUENTIAL DAMAGES, SO THE ABOVE EXCLUSIONS MAY NOT APPLY TO YOU. The consumer may be required to submit a sample of the defective material to CertainTeed for analysis. CertainTeed will then investigate the claim and may examine the material claimed to be defective. If a defect covered by this warranty is confirmed, CertainTeed, within a reasonable amount of time after the inspection, will repair or provide replacement material for the fencing, decking or railing, or refund the amount paid by the original owner for the fencing, decking or railing, and accessories, per the terms of this warranty. While CertainTeed vinyl fencing, decking and railing resists most common household stains like oil and grease, it will become dirty like any other product that is exposed to atmospheric conditions. Chalk may also accumulate on the surface. This is a normal condition for all pigmented materials which are constantly exposed to sunlight and the elements. Soil, grime and chalk can be simply removed with the help of your garden hose and a bucket of soapy water. If especially stubborn stains cannot be removed with normal household detergents, request a cleaner from your contractor. Always test cleaner on an inconspicuous area before full use. Mildew may be a problem in some areas. It appears as black spots on surface dirt and is usually first detected in areas not subjected to rainfall, such as under eaves and porch enclosures. For removal, prepare a solution as shown. Caution: greater concentrations may cause damage to the vinyl materials. Exterior vinyl building materials require little maintenance for many years. Nevertheless, common sense dictates that builders and suppliers of vinyl products store, handle and install vinyl materials in a manner that avoids damage to the product and/or the structure. Owners and installers should take a few simple steps to protect vinyl building materials from fire. Rigid vinyl fencing, decking and railing are made from organic materials that will melt or burn when exposed to a significant source of flame or heat. Building owners, occupants and outside maintenance personnel should always take normal precautions to keep sources of fire, such as barbecues and combustible materials, such as dry leaves, mulch and trash, away from vinyl fencing, decking and railing.